CD/DVD Duplication - Coda, Inc.
Coda, Inc. is a full service digital reproduction provider with over a dozen CD/DVD duplication towers under our belt. Our throughput is approximately 1000 discs per hour making us one of the fastest in the business to turn around your duplication projects. With this type of production capabilities; it makes duplicating professional CDs and DVDs in a short space of time effortless! Duplication is the process of “burning” data onto blank CD or DVD recordable discs using computer drives and specialized burning software. Information is extracted from the mastered disc or image and burned onto the recordable media with lasers found inside the drives. The data is then verified against the original master to ensure an exact copy has been reproduced and the machine either accepts or rejects the copied version during the finalization process. Once discs complete the burning process they move onto the printing line that is, if printing is required. Contrary to popular belief, some fear that duplicated discs may not always work in some playback devices. While there are several variables that can determine playback compatibility issues, advancements in technology both with discs and players have left these problems few and far between. Optical media is moving at a very fast pace and continues to be a dominant medium for multimedia and digital content delivery. However, not all blank discs are created equal so it is good practice to use professional grade media when considering duplication. This way you don’t have to worry about playback compatibility issues when your discs are out in the field. Coda, Inc. uses industry leading CD/DVD media (Taiyo Yuden/JVC) which is the proprietary brand recommended for commercial duplication and professional use. Below is a list of the available media formats Coda, Inc. is capable of duplicating. If for some reason the media format you want duplicated is not found on this list simply let us know, there is a good chance we can duplicate it. CD-Interactive 700 MB A mix mode format that includes a combination of documents, digital audio and video files for specific media players. Duplication is ideal for when you need a small run of CDs or DVDs and a quick turnaround but the biggest advantage of this process lies within the cost per disc savings when compared to replication. Typically, these savings are more visible when you require quantities of 500 or less. The many benefits from media duplication may extend further than you can imagine. Marketing firms can use it for promotional purposes and information exchange while in the music world it can be used for demos and CD releases. In addition, schools, churches, government agencies, production and film companies can all benefit greatly from media duplication. Coda, Inc. delivers speed, reliability and consistent quality products whenever you're seeking a cost-effective solution. 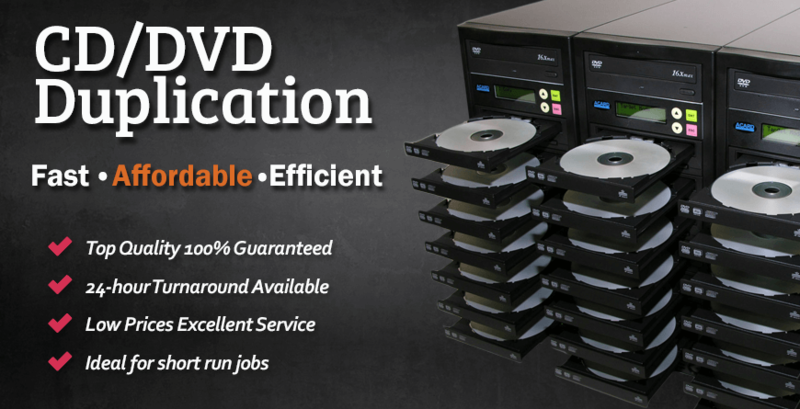 We are dedicated to providing quality duplication and complete customer satisfaction. With unbeatable quality, affordable and competitive prices, fast turnaround times, friendly and prompt customer service, we feel confident that you will be happy with our products and services. In the case of an unlikely event your duplication is defective please contact our Customer Service department for immediate assistance. We are dedicated to 100% Customer Satisfaction!